The FLTA Program is a nine-month, U.S. Department of State funded, non-degree program that provides young teachers of English an opportunity to refine their teaching skills, increase their English language proficiency and extend their knowledge of the society and culture of the United States, while teaching their native language to U.S. students and strengthening foreign language instruction at U.S. colleges and universities. Fulbright FLTA participants also interact with their host communities in conversation groups, extracurricular activities, and community outreach projects. 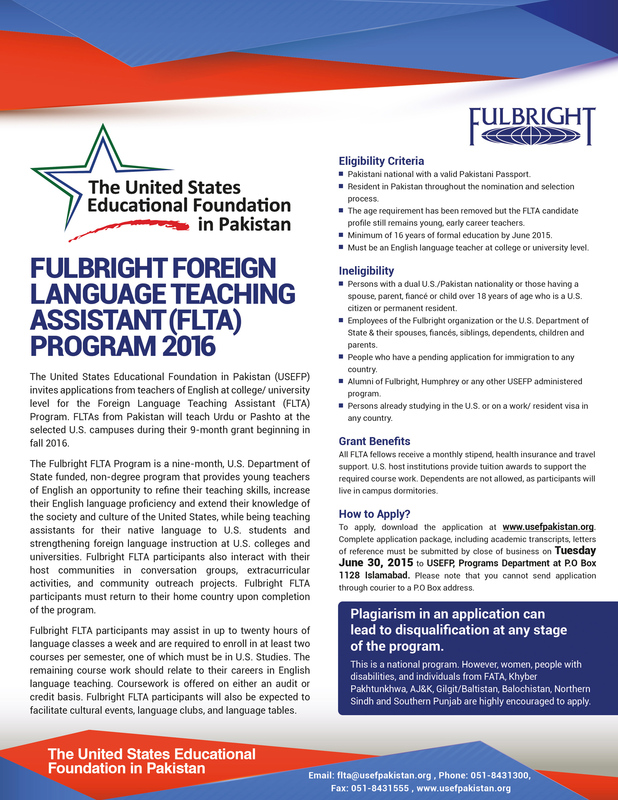 Fulbright FLTA participants must immediately return to their home countries upon completion of the program. Pakistani national with a valid Pakistani Passport. Resident in Pakistan throughout the nomination and selection process. Be a young, early career educator. Minimum of 16 years of formal education. Be a teacher of the English language or a related field at the college or university level. All application materials (original and one copy), including references, must be received by USEFP at P.O. Box 1128 Islamabad. Please note that you cannot send application through courier to a P.O. Box address.